Coconut Chicken Curry has it all – it is slightly sweet, can be spicy, and you can make it in thirty minutes or less. 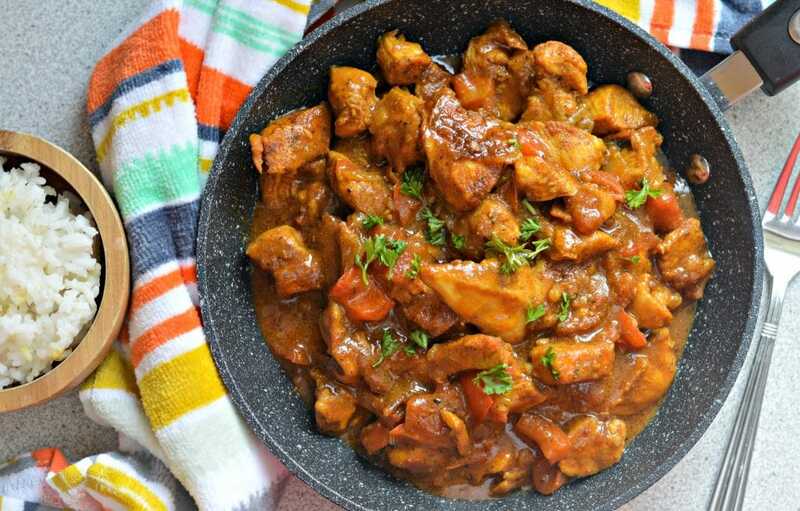 Coconut chicken curry is one of our favorite meals, not only because it is delicious, but also because it is so easy to make! The coconut flavor takes it to a whole new level – one that you and your family will love! The first time I made this recipe, I didn’t think that my kids would like it – in fact, I didn’t even think that they would try it. I’m happy to report that I was wrong – they loved it and that is why I make it so often now. 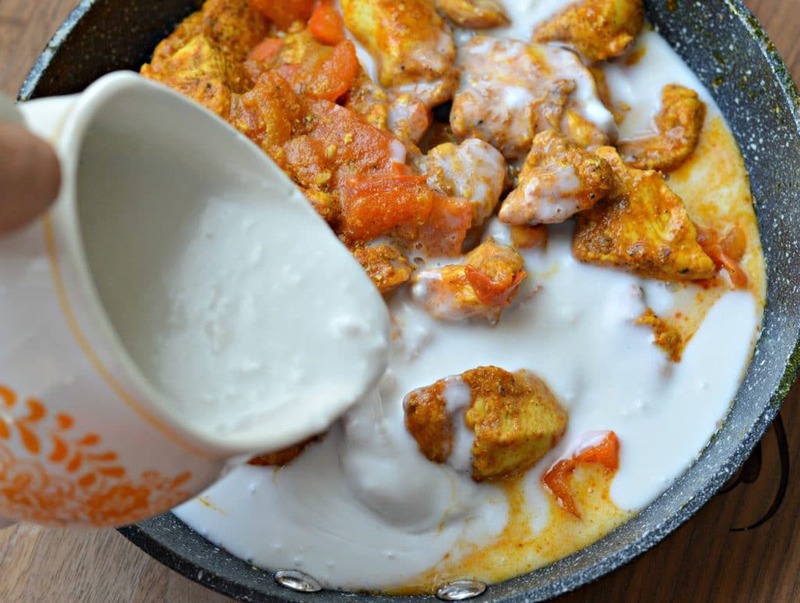 This coconut chicken curry is creamy, flavorful, and perfect even for picky eaters. I love trying to make dishes from different countries and cultures, and it is always so fun to experiment in the kitchen. Sometimes the food is great, and sometime it isn’t, but when it turns out delicious like this one, I just have to share it. The coconut milk gives it the perfect amount of creaminess that you will love. The secret to this dish it adding just enough spices is to the chicken to make it juicy and full of flavor. If you don’t have little kids eating it, you can add even more to make it spicy. No matter how you make it, if you follow this recipe, it will be delicious. 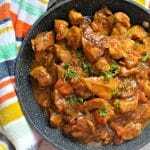 You start by cutting the chicken in cubes and seasoning it with a variety of spices such as ground cinnamon, ground cloves, cumin, garlic, paprika, salt, and pepper. 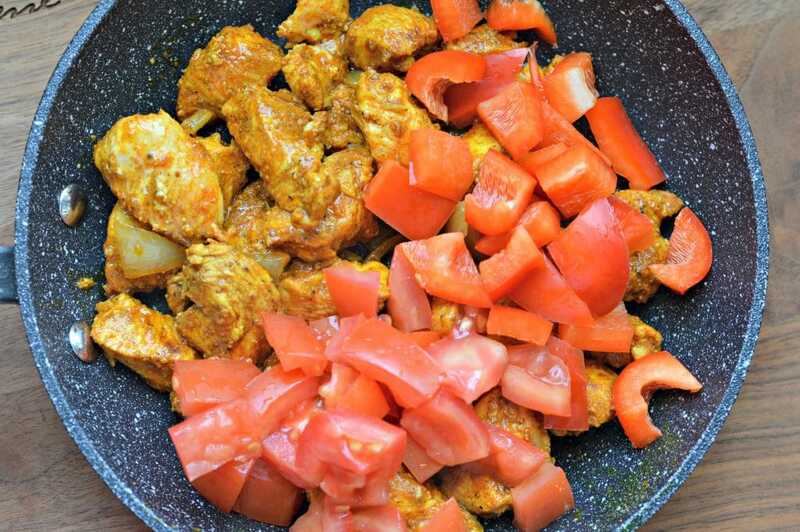 You then add it to a hot pan with onions that have been sauteed with curry powder. Next you add fresh ingredients like tomatoes and red peppers and even peas if you want. You will definitely want to use fresh tomatoes instead of canned so that you can maintain that fresh flavor. This recipe is a lifesaver on busy days, because it doesn’t take very long at all to make and everyone loves it. The first time that I ate Indian food was at a local restaurant and that was also the first time I tried chicken curry. It was simply delicious and since then I have been a big fan if Indian food, because they use lots of spices just like we do in Mexico. This version is kid-friendly, but you can add cayenne pepper to give it some kick if you want. You are going to love this version – if you do, don’t forget to follow me on Instagram and Facebook! Leave your comments in the comment box below and let me know how it turns out. Frying Pan – You will want to use a good frying pan to make this recipe. I like using one like this because it is deep enough to get all of the ingredients inside without spilling over. Coconut Milk – There are a few different brands of Coconut Milk, but I have found that they aren’t all the same. This is the brand that I use and it makes for a very creamy, delicious texture. Rice Cooker – I always serve this Coconut Chicken Curry recipe with rice, so it is helpful to have a good rice cooker like this one. Of course you can always use an instant pot instead – they are good for so many recipes! Coconut Chicken Curry has it all - it is slightly sweet, can be spicy, and you can make it in thirty minutes or less. Cumin Salt, Pepper for seasoning the chicken (you can also add ground cinnamon, nutmeg, and cayenne pepper if desired). Heat the Coconut Oil over medium high heat and add the onions. Add the chicken breasts and season with salt, pepper, cumin (and other optional seasonings) and cook until browned. Add the red pepper and tomatoes and stir well. Add the tomato sauce and the coconut milk and stir well. Let simmer for 20 minutes over medium heat. Add the brown sugar and stir well. Let cook for an additional 5 minutes and then serve over rice. Wow! I guess, this curry is going to be super delicious. Pinned! The nutritional information is way off. Please don’t think that you are only consuming 70 calories. Hi Declan – thank you for your comment. The recipe plugin that I use automatically calculates nutritional information, but you are right that something seems off. I am going to disable the nutrition information for now until I can figure it out. Thanks! When do you add the garlic? It’s delicious without it, but just curious. I’m trying it with marinara subbed for tomato sauce tonight (didn’t check pantry before starting…) and I’ve used a can of tomatoes successfully before. I also definitely think 1/4 cup sugar is sufficient.